One of the United States of America on the Pacific coast. There exists no authenticated record of the activities of Jews in California prior to 1849. During that year, attracted by the discoveries of gold, large numbers of them ventured into the new El Dorado, scattering over the entire area of the gold-fields. (A partial list of the Jewish pioneers of California is given in Markens, "The Hebrews in America," pp. 336, 337; but the list needs revision.) The constituent elements of the nascent Jewish communities came from every part of the world, including Australia, and some of them from the east and south of the United States. Divine services were held for the first time in San Francisco on Kippur Day, 1849, in a tent owned by Louis Franklin, and were attended by about ten persons (Leeser's "Occident," vii. 480; "Chronicles of Emanu-El," p. 16). The organization of the Jewish community was completed between July and October of the following year (see San Francisco). While the San Francisco community is the oldest as regards the date or dates of its organization, it received, after the collapse of many of the mining ventures, large accessions from the Jewish settlers in the gold regions. Many Jews had found their way to the mines, notably along the American river; and in Placer, Amador, and Yuba counties—then the centers of the gold excitement—and at every prominent point of settlement a Jewish "mining" congregation or benevolent society began to flourish. As most of these institutions have now passed out of existence, it may be well to preserve a partial record of them in this permanent form. For a complete list see "Emanu-El," Dec. 21, 1900, xi., No. 6. Hebrew Benevolent Society organized in 1852. A burial-ground is still cared for by the few families resident in the village. Congregation Re'im Ahubim organized 1853 from a previously existing society (1851) for the care of the Jewish insane. In 1852 there were three Jewish inmates in the State Asylum for the Care of the Insane at this place. In 1854 an Israelite named Carvalho, of Sephardic extraction, a member of General Fremont's expedition, settled in Los Angeles and suggested the founding of a benevolent society. Religious services were held as early as 1852 (see Los Angeles). 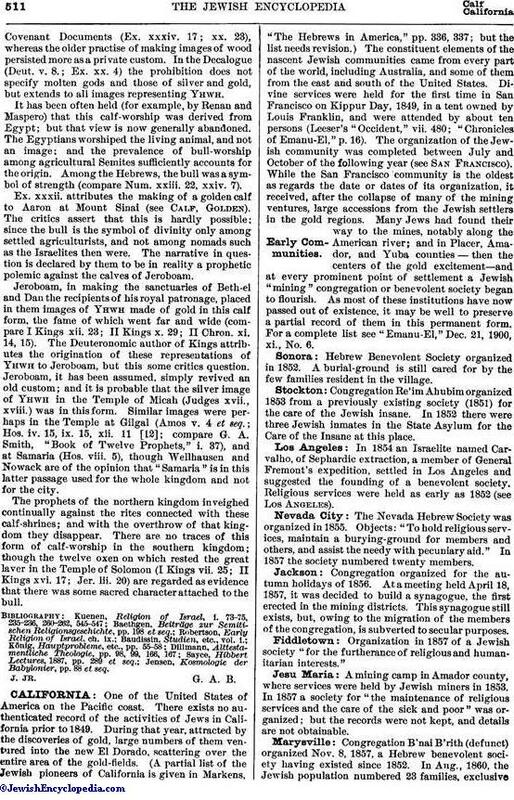 The Nevada Hebrew Society was organized in 1855. Objects: "To hold religious services, maintain a burying-ground for members and others, and assist the needy with pecuniary aid." In 1857 the society numbered twenty members. Congregation organized for the autumn holidays of 1856. At a meeting held April 18, 1857, it was decided to build a synagogue, the first erected in the mining districts. This synagogue still exists, but, owing to the migration of the members of the congregation, is subverted to secular purposes. Organization in 1857 of a Jewish society "for the furtherance of religious and humanitarian interests." A mining camp in Amador county, where services were held by Jewish miners in 1853. In 1857 a society for "the maintenance of religious services and the care of the sick and poor" was organized; but the records were not kept, and details are not obtainable. Congregation B'nai B'rith (defunct) organized Nov. 8, 1857, a Hebrew benevolent society having existed since 1852. In Aug., 1860, the Jewish population numbered 23 families, exclusiveof 105 bachelors. At the present date the town contains four Jewish families. Congregation organized 1857 out of previously existing societies, which had flourished since 1851. A Jewish society organized Sept. 8, 1856, and a congregation for the autumn holidays of 1857. The Hebrew Indigent Sick and Burial Society organized March 1, 1857. Organization of the Hebrew Benevolent Society in 1859. There existed Jewish burial-places which were owned by these extinct societies in Sonora, Oroville, Nevada City, Folsom, and Grass Valley; and these are piously cared for by the descendants of the settlers or families subsequently arrived. After 1870 most of the organizations mentioned became defunct, the population having either shifted to the new metropolitan centers or returned to the East. Out of a few of them small B'nai B'rith lodges were organized and incorporated with District No. 4 of that order. Congregations remain at the following points, besides the smaller ones given below: San Francisco (6), Los Angeles (2), Sacramento (1), Stockton (2), Oakland (2), San José (1), San Diego (1); total, 15. The Jews were prominent in the organization of the new state of California. So far as the record has been completed mention can be made of Solomon Heydenfeldt, chief justice of the supreme court of California (1852-57); Henry A. Lyons, one of the first three justices of the same court; Washington Bartlett, alcalde of San Francisco in 1849, and governor of California in 1887; Elkan Heydenfeldt, brother of Solomon, and Isaac Cardoza, both members of the California legislature of 1852; Samuel Marx, United States appraiser of the port of San Francisco; Joseph Shannon, county treasurer of San Francisco in 1851; A. C. Labatt, an alderman of San Francisco in the same year; besides a large number of business men. 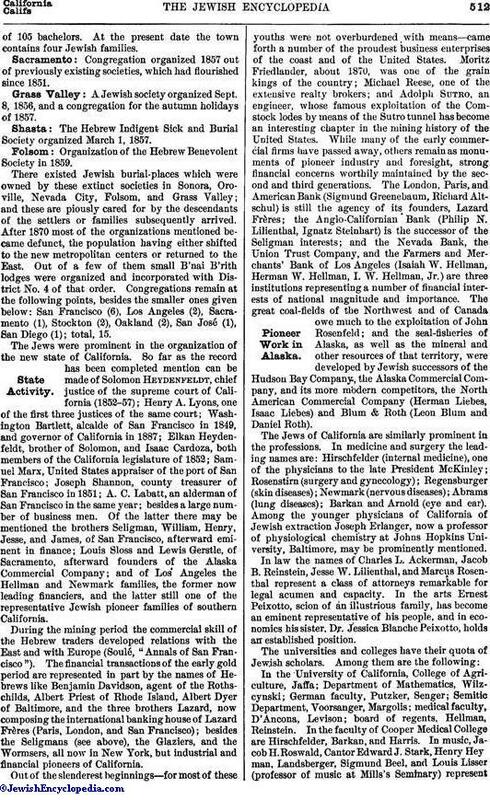 Of the latter there may be mentioned the brothers Seligman, William, Henry, Jesse, and James, of San Francisco, afterward eminent in finance; Louis Sloss and Lewis Gerstle, of Sacramento, afterward founders of the Alaska Commercial Company; and of Los Angeles the Hellman and Newmark families, the former now leading financiers, and the latter still one of the representative Jewish pioneer families of southern California. During the mining period the commercial skill of the Hebrew traders developed relations with the East and with Europe (Soulé, "Annals of San Francisco"). The financial transactions of the early gold period are represented in part by the names of Hebrews like Benjamin Davidson, agent of the Roths-childs, Albert Priest of Rhode Island, Albert Dyer of Baltimore, and the three brothers Lazard, now composing the international banking house of Lazard Frères (Paris, London, and San Francisco); besides the Seligmans (see above), the Glaziers, and the Wormsers, all now in New York, but industrial and financial pioneers of California. Out of the slenderest beginnings—for most of these youths were not overburdened with means—came forth a number of the proudest business enterprises of the coast and of the United States. Moritz Friedlander, about 1870, was one of the grain kings of the country; Michael Reese, one of the extensive realty brokers; and Adolph Sutro, an engineer, whose famous exploitation of the Comstock lodes by means of the Sutro tunnel has become an interesting chapter in the mining history of the United States. While many of the early commercial firms have passed away, others remain as monuments of pioneer industry and foresight, strong financial concerns worthily maintained by the second and third generations. The London, Paris, and American Bank (Sigmund Greenebaum, Richard Altschul) is still the agency of its founders, Lazard Frères; the Anglo-Californian Bank (Philip N. Lilienthal, Ignatz Steinhart) is the successor of the Seligman interests; and the Nevada Bank, the Union Trust Company, and the Farmers and Merchants' Bank of Los Angeles (Isaiah W. Hellman, Herman W. Hellman, I. W. Hellman, Jr.) are three institutions representing a number of financial interests of national magnitude and importance. The great coal-fields of the Northwest and of Canada owe much to the exploitation of John Rosenfeld; and the seal-fisheries of Alaska, as well as the mineral and other resources of that territory, were developed by Jewish successors of the Hudson Bay Company, the Alaska Commercial Company, and its more modern competitors, the North American Commercial Company (Herman Liebes, Isaac Liebes) and Blum & Roth (Leon Blum and Daniel Roth). The Jews of California are similarly prominent in the professions. In medicine and surgery the leading names are: Hirschfelder (internal medicine), one of the physicians to the late President McKinley; Rosenstirn (surgery and gynecology); Regensburger (skin diseases); Newmark (nervous diseases); Abrams (lung diseases); Barkan and Arnold (eye and ear). Among the younger physicians of California of Jewish extraction Joseph Erlanger, now a professor of physiological chemistry at Johns Hopkins University, Baltimore, may be prominently mentioned. In law the names of Charles L. Ackerman, Jacob B. Reinstein, Jesse W. Lilienthal, and Marcus Rosenthal represent a class of attorneys remarkable for legal acumen and capacity. In the arts Ernest Peixotto, scion of an illustrious family, has become an eminent representative of his people, and in economics his sister, Dr. Jessica Blanche Peixotto, holds an established position. In the University of California, College of Agriculture, Jaffa; Department of Mathematics, Wilzcynski; German faculty, Putzker, Senger; Semitic Department, Voorsanger, Margolis; medical faculty, D'Ancona, Levison; board of regents, Hellman, Reinstein. In the faculty of Cooper Medical College are Hirschfelder, Barkan, and Harris. In music, Jacob H. Roswald, Cantor Edward J. Stark, Henry Hey man, Landsberger, Sigmund Beel, and Louis Lisser (professor of music at Mills's Seminary) representabilities recognized throughout the West. Louis Sloss until his recent demise was treasurer of the University of California, being succeeded by Lewis Gerstle; Julius Jacobs is the subtreasurer of the United States at San Francisco, and Herman Silver was director of the United States Mint at Denver, Col. The bench of California now has Max C. Sloss, one of the youngest, but acknowledged to be one of the most learned, of the judges of the superior court of San Francisco. Julius Kahn is now member of Congress from the Fourth California District (San Francisco). In journalism, M. H. De Young, proprietor of the San Francisco "Chronicle," is well known; and in literature the native authoress, Emma Wolf, needs but to be mentioned. 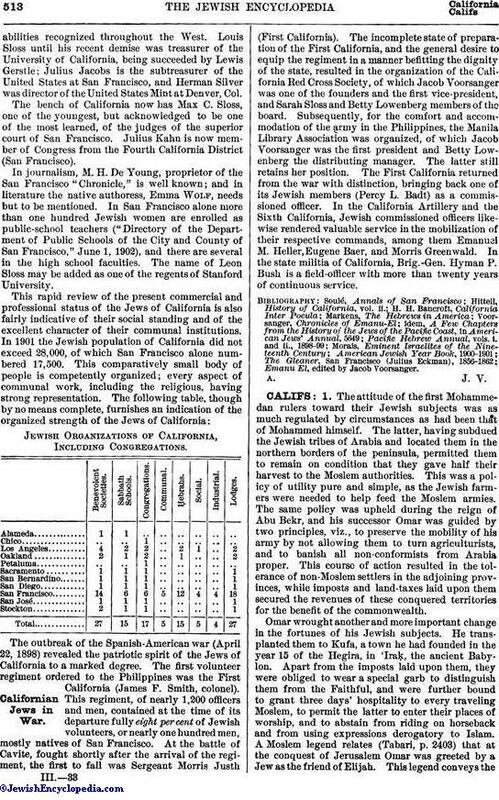 In San Francisco alone more than one hundred Jewish women are enrolled as public-school teachers ("Directory of the Department of Public Schools of the City and County of San Francisco," June 1, 1902), and there are several in the high school faculties. The name of Leon Sloss may be added as one of the regents of Stanford University. Jewish Organizations of California, Including Congregations. Alameda 1 1 .. .. .. .. .. ..
Chico .. .. 1 .. .. .. .. ..
Petaluma .. .. 1 .. .. .. .. .. The outbreak of the Spanish-American war (April 22, 1898) revealed the patriotic spirit of the Jews of California to a marked degree. The first volunteer regiment ordered to the Philippines was the First California (James F. Smith, colonel). This regiment, of nearly 1,200 officers and men, contained at the time of its departure fully eight per cent of Jewish volunteers, or nearly one hundred men, mostly natives of San Francisco. At the battle of Cavite, fought shortly after the arrival of the regiment, the first to fall was Sergeant Morris Justh (First California). The incomplete state of preparation of the First California, and the general desire to equip the regiment in a manner befitting the dignity of the state, resulted in the organization of the California Red Cross Society, of which Jacob Voorsanger was one of the founders and the first vice-president, and Sarah Sloss and Betty Lowenberg members of the board. Subsequently, for the comfort and accommodation of the army in the Philippines, the Manila Library Association was organized, of which Jacob Voorsanger was the first president and Betty Lowenberg the distributing manager. The latter still retains her position. The First California returned from the war with distinction, bringing back one of its Jewish members (Percy L. Badt) as a commissioned officer. In the California Artillery and the Sixth California, Jewish commissioned officers likewise rendered valuable service in the mobilization of their respective commands, among them Emanuel M. Heller, Eugene Baer, and Morris Greenwald. In the state militia of California, Brig.-Gen. Hyman P. Bush is a field-officer with more than twenty years of continuous service. Emanu El, edited by Jacob Voorsanger.